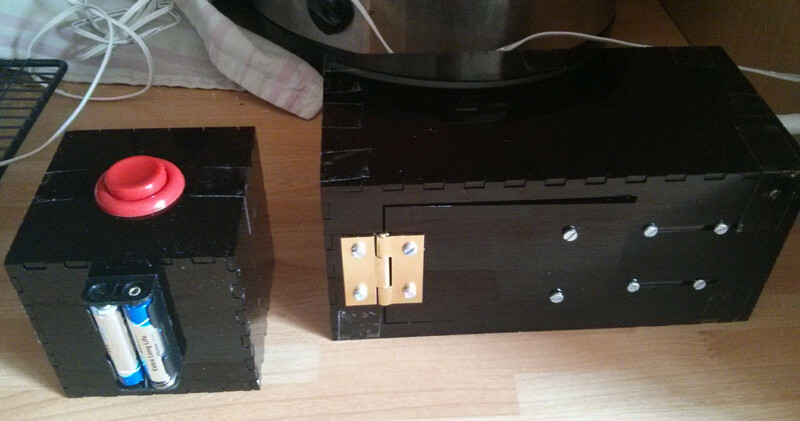 As a bit of fun for our stand at ARM TechCon, I built this business card dispenser. On the left is an arcade button and a 6LoWPAN transmitter. When the button is pressed, it sends a message with CoAP to the box. The box activates a relay, making the spring-loaded door pop open. The black acrylic was cut on Cambridge Makespace’s laser cutter. Here’s an earlier prototype, built at home. What we’re really demoing here is the NAT64 wireless gateway, but the button is more fun.